The Franschhoek Wine Valley is renown for it's superb wines and world-class restaurants and winter is a special time to be here. The surrounding mountains are often capped with snow and our guesthouses are warm and inviting. Join us for a wine tasting with a difference, on the back of a Safari Vehicle (don't worry, blankets will be provided when its chilly). Taste 5 stunning wines while driving around a picturesque vineyard searching for the various wild game that live between the trees. Follow that up with a tour of their ancient cellar, the oldest in the village, complete with spider webs on the walls (just don't lean against it) and finish off with a glass of bubbly at the neighbouring farm with the best views in town! We meet at the Franschhoek Adventure Centre in the Main Rd of Franchhoek and proceed up the hill to the vineyard. Starting at the tasting room with a little welcome drink, you board the safari vehicle and move onto the vineyard area. Your onboard Sommelier will talk you through the 5 wines you will taste and give you some fascinating facts about the farm and the wine. Look out for the various wild game that reside on the farm, enjoy the magnificent view, spend some time at the waterfall (which flows in winter mainly) and enjoy the tranquility of the surroundings. On return to the tasting room you will enjoy a tour of the farms ancient underground cellar. Steeped in history, have a look at the very old bottles that line the walls and take in the ancient atmosphere. Once emerging into the sunlight once again, you will be transported to the neighbouring farm for a glass of bubbles on the lawn overlooking the Franschhoek valley in all its splendour, definitely the best view of the village and the mountains. You return to the Franschhoek Adventure Centre, where your journey began and go home with wonderful memories of a day well spent. Transport to the various venues. 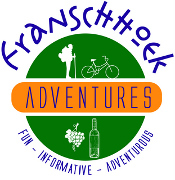 We meet at and return to the Franschhoek Adventure Centre at shop 5, 62 Hugeunot Rd, Franschhoek. Know your limit, drink responsibly. R 1 230 single or per extra person. R 1 600 per single or per extra person. Franschhoek Adventures welcomes you to our beautiful and historical valley where outdoor fun and adventure awaits. We look forward to hearing from you.